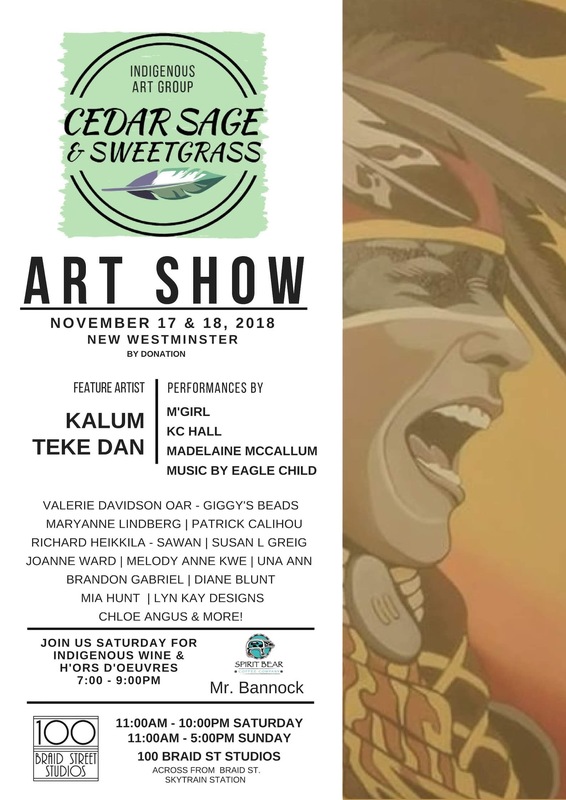 Cedar, Sage and Sweetgrass is an eclectic community of contemporary indigenous artists who are inspired by each other and who want to share their work in new ways. The group features artists who produce drawings, paintings, beading, woodworking, carving, Silversmithing and even dress making. 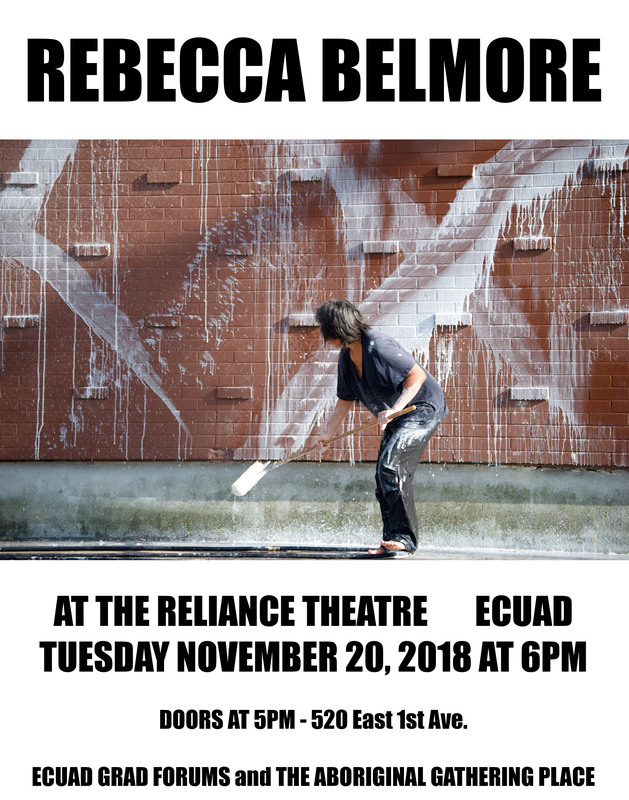 Rebecca Belmore is a member of Lac Seul First Nation (Anishinaabe), and is an internationally recognized multidisciplinary artist currently residing in Toronto. Rooted in the political and social realities of Indigenous communities, Belmore’s works make evocative connections among bodies, land and language. Her exhibitions: include Biinjiya’iing Onji (From Inside), documenta 14 (2017); KWE: The Work of Rebecca Belmore, Justina M. Barnicke Gallery (2011); Rebecca Belmore: Rising to the Occasion, Vancouver Art Gallery (2008); and Fountain, Venice Biennale (2005). Performances include: Facing the Monumental (2012); Victorious (2011); X (2010); Vigil (2002); Wild (2001), and Creation or Death We Will Win (1991). Belmore’s sculptures and installations include Wave Sound, Parks Canada, 2017; Trace, Canadian Museum for Human Rights (2014), and Ayum-ee-aawach Oomama-mowan: Speaking to Their Mother, (performances 1991, 1992, 1996 and 2008). Belmore received the Governor General’s Award in Visual and Media Arts in 2013, the Hnatyshyn Visual Arts Award in 2009, the Jack and Doris Shadbolt Foundation’s VIVA Award in 2004, and an OCAD University Honorary Doctorate in 2005. Also in 2005, she was Canada’s official representative at the Venice Biennale. In 2016, Rebecca was awarded the prestigious Gershon Iskowitz Prize by the Gershon Iskowitz Foundation in partnership with the Art Gallery of Ontario. Rebecca was also a 2018 recipient of an Honorary Doctorate from ECUAD. 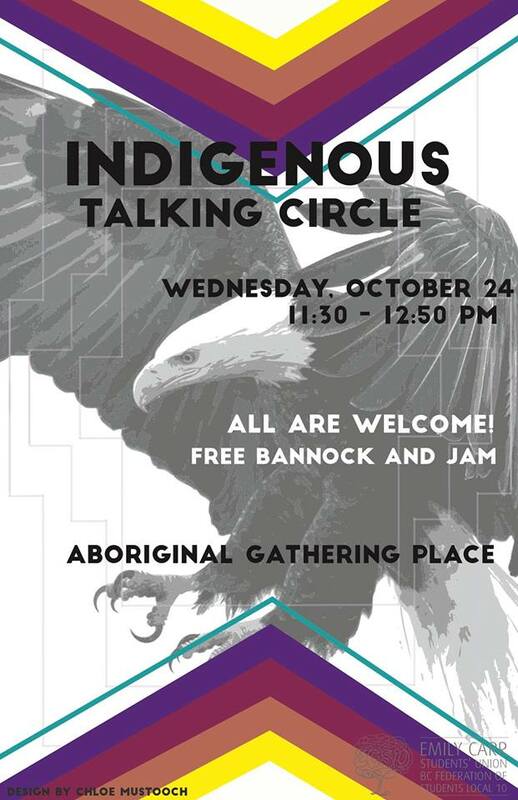 The Emily Carr Students’ Union and Aboriginal Gathering Place are hosting the first Indigenous Talking Circle of the year. Come hear about Indigenous students’ experiences on campus, ask questions in a safe and respectful space, and learn from each other. All are welcome. We are very pleased to present artist Dana Claxton! 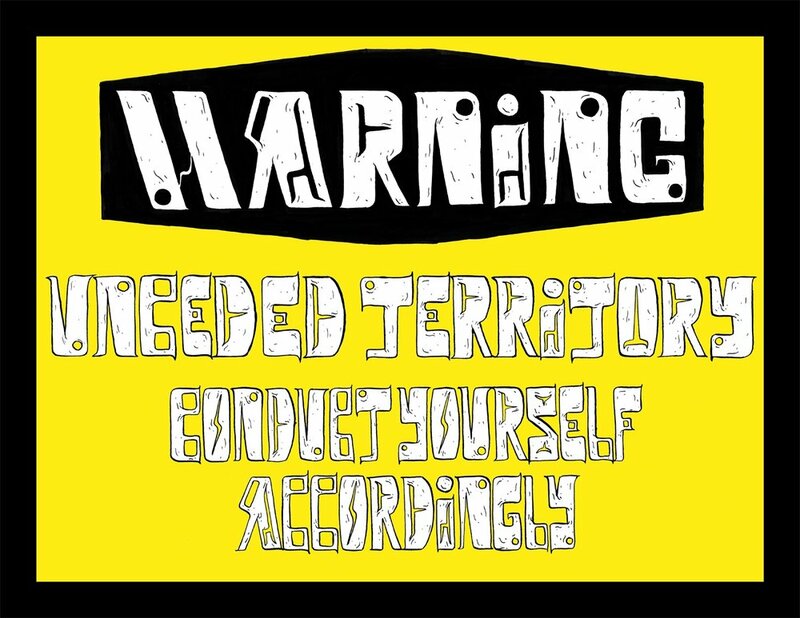 Dana Claxton works in film, video, photography, single- and multi-channel video installation, and performance art. Her practice investigates beauty, the body, the socio-political, and the spiritual. Her work has been shown internationally at the Museum of Modern Art (NYC), Walker Art Centre, Sundance Film Festival, Eiteljorg Museum, and the Museum of Contemporary Art (Sydney) and held in public collections including the Vancouver Art Gallery, National Gallery of Canada, Art Bank of Canada, and the Winnipeg Art Gallery. She has received numerous awards including the VIVA Award and the Eiteljorg Fellowship. Claxton was born in Yorkton, Saskatchewan, and her family reserve is Lakota First Nations – Wood Mountain, located in beautiful southwest Saskatchewan. Her paternal Euro-Canadian grandmother taught her how to harvest and preserve food and her maternal Lakota grandmother taught her to seek justice. Dana is the youngest of four siblings, an auntie, niece, cousin, and daughter. Baby Girlz Gotta Mustang, a lightjet C-print photograph by Dana Claxton. From Mustang Suite. 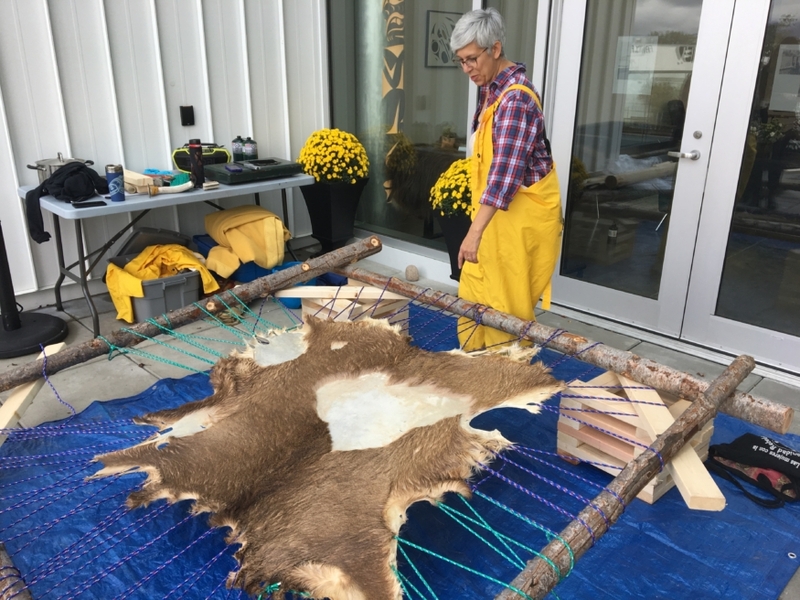 Métis artist Kim Stewart spent the first week of October in residence at the Aboriginal Gathering Place, welcoming the entire Emily Carr community to join her in the process of traditionally tanning a deer hide. Kim, an interdisciplinary artist based in Kamloops, has been practicing hide tanning for nearly 20 years. She also describes her practice as Metissage, defined as a woven mix of cultural thinking. Kim holds associate degrees in Fine Art, Illustration and Graphic Design, and a Master’s Degree in Art Education from SFU. At SFU she was supervised by Celeste Snowber, and became interested in exploring her Métis identity through art. Kim spent many years as an instructor at the College of New Caledonia in Prince George, teaching fine arts, web and graphic design, and Aboriginal studies. She also developed an online curriculum that combines artistic practice, research and critical writing to explore and define Métis history. In particular, her course studies how Métis women were economically involved in Canada through the production of textiles and goods like octopus bags and hide garments. Historically, Métis women would use animal hides to make garments that reflected European fashions. Handmade waistcoats and overcoats made from hide and decorated with porcupine quills and beadwork were produced by Métis artisans and worn by prominent Canadian politicians in the 19th century. Once it’s soft (“like flannel”), Kim smokes the hide. It’s sewn into a pillowcase shape and then placed over a bucket of smoldering spruce. The smoke releases the tannins from the wood, which give the hide its distinctive colour and waterproofs it. Kim plans to leave the tanned deer hide at Emily Carr for students and other members of the community to use as a material in their own art practices. To learn more about Kim and her work, visit her website. We are very pleased to present artist Jeneen Frei Njootli! 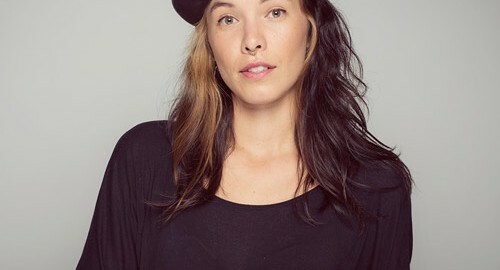 Jeneen Frei Njootli is an interdisciplinary artist, co-creator of the ReMatriate Collective and a member of Vuntut Gwitchin First Nation who has been living and working as an uninvited guest on unceded Musqueam, Squamish, Sto:lo and Tsleil­Waututh territories for a decade. She uses mixed media, sound-based performances, textiles and installation work to explore history embedded in cultural materials, geopolitics and the politics of Indigenous art. For her recent Media Arts Residency at the Western Front in Vancouver, she hosted a free workshop on how to create and update Wikipedia pages for Indigenous women artists. The 2017 recipient of the Contemporary Art Society Vancouver Artist Prize, she has exhibited at the Fierman Gallery in New York, the Southern Alberta Art Gallery and the Vancouver Art Gallery among others. After graduating from Emily Carr University of Art + Design in 2012, Frei Njootli completed her MFA at the University of British Columbia in 2017. We are very pleased to present Billy-Ray Belcourt! Billy-Ray’s debut book of poems, This Wound is a World (Frontenac House 2017), won the 2018 Griffin Poetry Prize and the 2018 Robert Kroetsch City of Edmonton Book Prize. It was also named the Most Significant Book of Poetry in English by an Emerging Indigenous Writer at the 2018 Indigenous Voices Awards. It was also named by CBC Books as the best “Canadian poetry” collection of 2017. His sophomore book, NDN Coping Mechanisms: Notes from the Field, is due out in the fall of 2019 with House of Anansi Press. Indigenous artistic expressions continually shift in response to cultural circumstances and facilitates the reinvention and re-interpretation of traditional practices. 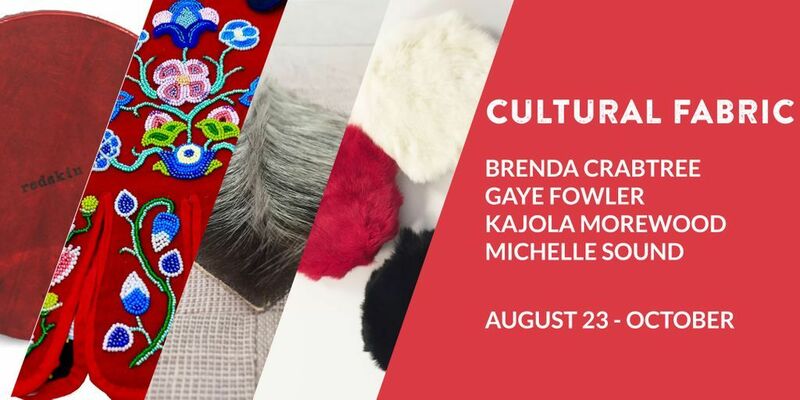 This exhibition challenges notions about how Indigenous art is created and perceived, with works ranging from a variety of artistic disciplines and materials including, fur, hide, wool and cedar. This exhibition is curated by Brenda Crabtree and draws from the work done at the Aboriginal Gathering Place, Emily Carr University of Art & Design. Funded by The Winnipeg Foundation.The blanket use of the word ‘Indigenous’ can eclipse the incredible diversity within Indigenous cultures across Turtle Island. Oneself, and one another is an exploration of this and the inter-identities of Indigenous artists in Canada. Each of the four artists creates work about their own distinct culture, interests and lives. What we discover is how non-homogenity is itself a defining feature of Indigenous culture, a means of working together, and a source of great power.The great power brings together four artists, who independent of each other explore ideas of gender, multiple cultural identities, tradition, age, territory, the Dakota Nation, the Metis Nation, the Mi’kmaq Nation, Lake Babine Nation, environmental issues, history, punk culture, decolonization, the lives of artists and Indigeneity. Together the artists form an exhibition that places their Indigeneity at the centre, but makes room to celebrate each difference and explore how combined each difference strengthens each other. Jeneen Frei Njootli’s solo exhibition in the B.C. Binning Gallery, my auntie bought all her skidoos with bead money, speaks to refusals, belongings, loss and love, through a new and deeply personal body of work. Its propellant is a series of cultural belongings which are not, in fact, on view: hand-sewn beadwork gifted to Frei Njootli by the women of her family. On first entering the gallery, visitors encounter four large-scale sheets of steel leaning against the walls and floor. Upon their surfaces we catch fugitive impressions left by the beads, which have been pressed into the artist’s skin and then transferred, by way of grease prints, from her skin to the steel. As they inhabit the gallery’s atmosphere over time, the steel plates gradually respond to their environment and, depending upon humidity and temperature fluctuations, the spectral floral patterns might approach the viewer or recede from view, as though of their own volition. A member of the self-governing Vuntut Gwitchin Nation, Frei Njootli’s practice is both invested in and materially tethered to that community, its way of life and the beings that support it. Her relationship to the matter with which she works is not abstract but defined by her lived experience in the far North. Moving between media, she considers the nature of her culture’s belongings (she rejects the term “artifacts”) as they are entangled with ancestral memory, contemporary community and care. She navigates their complex relationships to her own impermanent body and to the continued consumption of Indigenous people’s histories, labour and knowledge. In her actions and interventions, she asks repeatedly of herself and her audiences: Who or what is the sender? Who or what receives? At the back of the gallery is a new video work commissioned by CAG for this exhibition. A single take, played forward and then in reverse in an endless, seamless loop, records the slow appearance of an expansive panel of floral beadwork impressed upon the artist’s bare back. Projected at a scale echoing that of the steel sheets, Frei Njootli’s skin — which exceeds the boundary of the image — becomes an expansive, slowly undulating field. Almost imperceptibly, the patterned impressions emerge, as though produced by the skin itself.